As part of our dental health programme for the local people of Rickmansworth and Watford we thought we would write a blog post about the importance of early preventive care for children, why it is important, what the potential risks are not looking after their teeth and how you can go about ensuring that your children’s health stays as good as possible. A recent report in The dentistry section of Medical News Today Highlighted a problem with children not receiving the early preventive care that they should. Of the 2505 children that were in the study conducted by Dr Jonathan Maguire a paediatrician and researcher at St Michael’s Hospital, 39% of those children had never been to a dentist. The research programme followed children from birth through to the early years at the age of around four years old. He found that there were links with lower family income and prolonged bottle use which led to a highly daily intake of sweetened drinks such as juice, unbelievably with each one Increase in the amount of sweetened drinks that those children drank daily, the odds of never visiting the dentist increased by 20% and nearly a quarter of all the children do had visited the dentist had at least one cavity. Other studies by the Adult Dental Health survey and National Dental Health survey revealed that cavities can lead to dental fillings which are unfortunately very common in the UK, The studies showed that 84% of adults have at least one or more fillings and each of those adults have on average 7 fillings. This is a direct result of only 42% of adults using a toothbrush and toothpaste for their oral care and only 21% of adults visiting the dentist annually. These factors combine to mean that dental decay is more likely to occur and less likely to be detected and prevented. This means that the likelihood of having dental fillings is increased in the long-term. One of the simplest ways of ensuring that your children’s teeth stay healthy is firstly to visit the dentist and secondly to cut down on the amount of sugar they consume. But how much sugar is too much? The Journal of Dental Research recently carried out a systematic review to inform WHO guidelines on the effects of restricting sugar intakes in various age groups. The research looked at % of sugar in a daily diet and its relationship to the onset of decay. One of the problems with this research is that various publications have taken different views as to what it means, some of them have taken the step of converting this % of sugar into a spoonful amount, On the one hand this makes it easier to work out how much sugar you should be having, but is not strictly true to the research. These Papers have converted this into between 5 and 7 teaspoons per day. Unfortunately doing this leads people to assume that they can have 5 or 7 teaspoons per day on their cereal, coffee , tea or anywhere else they add sugar. The biggest problem is they forget that most of the sugar we eat daily is hidden within foods, not added by us afterwards. If we only count the spoonfuls of sugar we add to our food then we will be dramatically exceeding the recommended amounts! 42 out of 50 of the studies in children, and 5 out of 5 in adults, reported at least one positive association between sugars and dental decay there was “moderate quality” evidence showing a lower risk of dental decay when sugar intake is less than 10% of calorie intake, compared with more than 10% there was “very low quality” evidence showing a lower risk of dental decay when sugar intake is less than 5%, compared with 5-10% of calorie intake. So it seems that the research is suggesting if we keep our sugar intake below 10% of calorie intake then there is ‘moderate quality’ evidence to show a lower risk of dental decay. Our dental practice in Watford is dedicated to helping the local people with their oral health. Our dental hygienists can work with you and your children to ensure that they stay as healthy as possible and keep their teeth for life. We urge you to help your children clean their teeth well at home, at least twice per day with a fluoride toothpaste, cut down on the amount of sugar that they consume and also make regular visits to the dentist where we can keep an eye on their dental health and let you know of any potential problems and keep current problems under control. What Are Clear Braces And How Do They Work? In today’s modern world where aesthetics and the way things look is so important people are looking for alternatives to the classic train track braces in order to have straighter teeth. This is where clear braces clearly step into their own (please excuse the pun!). Clear orthodontic braces provide adults in the local Rickmansworth and Watford area the ideal way to have straighter teeth without anyone else knowing, let us explain why, how and what exactly this revolutionary style of orthodontics can offer you. When a small amount of pressure is applied to a tooth, it will naturally move in the direction of that pressure. The process of tooth movement is well understood by science and the bone around your tooth is quite capable of making way to tooth movement and re-forming behind it. Conventional train track braces apply pressure to the tooth by joining them altogether and using certain teeth as anchors. These anchored teeth are able to pull the other teeth into the correct alignment. Clear braces work by using a series of clear aligners. Each aligner puts a small amount of pressure on to the teeth in the direction of the movement required. Naturally, as the tooth moves the pressure will reduce and it is at this point that you will need to replace the aligner with a new one. The Invisalign orthodontic system we use plans how many aligners you need using computer software right at the beginning of your treatment. The computer will then decide how many aligners you need in order to move the teeth in the direction required. When you have your Invisalign braces you will be provided with two or three aligners, you will then need to come back to the practice to have your progress monitored where we can provide you with further aligners. Typical treatment takes around 12 months with an aligner lasting approximately 2 weeks. How do I know what I will look like after orthodontics? 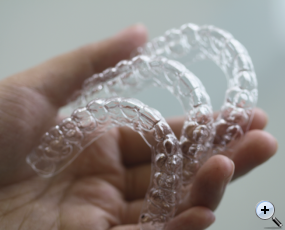 This is one of the most amazing things about Invisalign clear braces, they offer something called a Clincheck™. This Is where we take records of your teeth as they are now, these are then digitised onto a computer screen and the software can then be used to move your teeth virtually. The new arrangement of your teeth after braces can then be seen on the computer screen and you can make fine adjustments to the exact way you want to look. The computer program also allows for a video movie of your actual teeth moving into their new position, this will not be a pre-programmed movie of the previous patient, it will actually be your own teeth, which you will be able to see move from the current position today new position. Clear braces versus metal braces. This photograph shows the difference between patients wearing clear braces and metal braces. You can clearly see that the metal braces in the further picture are much more pronounced an obvious than the clear braces worn by the person in the closest photograph. There are however some disadvantages with clear braces. The biggest disadvantage is that the Invisalign © system is normally only used to move the teeth in the aesthetic zone, these are typically the front six teeth on the top and bottom jaw. If you have more complex orthodontic requirements, such as rearranging your bite, or moving back teeth. Then conventional braces may be the option required to you. It is worth noting, however, that tooth coloured braces may be used in place of the conventional metal braces. How much are clear braces? We know cost is an important consideration for you. There is no way to accurately answer this question without first coming in for a consultation. At that initial meeting the dentist will examine you and take xrays etc. From this he/she will be able to give you an accurate guide to the cost of these clear braces. In our practice the average investment is in the region of £2500 – this will include all necessary impressions, records, radiographs, all aligners, any refinements needed and retainers. There are many factors that determine the cost of your Orthodontic treatment: how extensive the issues you want corrected, how long your treatment plan will last, where you live, and the specific treatment details prescribed by your dentist or orthodontist. These prices are for illustrative purposes only and individual prices may vary. Clear orthodontic braces provide an excellent way to achieve straighter teeth with no one else knowing, they are an affordable option for many patients living in the Rickmansworth, Chorleywood and Watford area of Hertfordshire. New Road Dental practice in Croxley green are proud to offer Invisalign to all of their patients. //newroaddental.co.uk/wp-content/uploads/2016/09/New-Road-Dental-Logo-600px-V2.png 0 0 generalchanges2 //newroaddental.co.uk/wp-content/uploads/2016/09/New-Road-Dental-Logo-600px-V2.png generalchanges22014-05-07 15:59:192016-10-07 09:30:41What Are Clear Braces And How Do They Work?